Northamptonshire Titans secured the U16 Girls North Conference title with a 74-63 success at Derby Trailblazers. Hannah Bird got proceedings under way through a well-executed inbound play, followed up by a Lauren Dabbs bucket. And Titans continued to show why they are the top side with Emma Wickham took full control under the boards and Kenny Hamilton kept Trailblazers’ leading scorer under wraps throughout the first half. Titans continued to move the ball well as Wickham, Dabbs and Tegan Millar were the recipients as the wave of offence continued to put the Derby side under pressure. The fourth period saw Trailblazers perform better but the day belonged to Titans who can now prepare for the play-offs with three games still to play. Titans top scorers: Dabbs 23, Wickham 15, Bird 10. Titans Under-16 boys moved a step closer to securing home court advantage in the play-offs after they beat Sheffield Sharks 83-66. Titans were 21-19 up at the end of the first quarter with Sam Grant causing Sharks problems while Jacob Cirtautas battled well at both boards and Jude Carmichael’s efforts were rewarded with transition scores. Titans turned up the heat with a 10-0 run and they held a 12-point advantage at half-time before Ben Nailer opened the third period with a three-pointer. Titans stood firm after that and both teams battled well in the final quarter but the hosts secured victory and now know that a win at Birmingham will wrap up second place. Titans top scorers: Nailer 25, Grant 22, Carmichael 13, Cirtautas 10. Titans women suffered a 77-45 defeat at Derbyshire Gems in Division Two. In the previous encounter, Titans won a two-point nail biter but this time they started really slowly, hampered by regular top scorer Paige Vyse rolling her ankle on the first offense, an injury which saw her withdrawn from the game. Titans did try to rally but the fast break basketball of Gems was superior. Titans’ offence was out of sync and they struggled throughout but they still have a shot at taking the final play-off spot over the next two weeks. Titans maintained their fine form in the U14 Boys Midlands West Conference with a big 100-52 victory at Abingdon Eagles. Despite their valiant efforts, Abingdon couldn’t cope with the relentless defensive pressure and by half-time Titans had built up a 55-26 lead. It was more of the same in the second half as Titans powered to the win with Sean Rawlins and Isaac Round contributing 51 of the team’s points, scoring 26 and 25 respectively while three other players – Ciaran Myers (17), Benji Leesing (11) and Oskar Knight (10) – hitting double figures. Titans suffered a 79-53 defeat to Oaklands Wolves in the U14 Girls Midlands Conference. Titans got off to a flying start, using their skills to read the defence well and they were only trailing by three points at the end of the first quarter. But they lost confidence in the second, allowing Wolves to dictate play. Stern words from the coach set Abi Smith on the attack as she scored an impressive lay-up under extreme pressure and Titans followed this example by getting their performance back on track. Titans came out strong in the second half and were able to perform as the same level as their opponents. The score had unfortunately got away from the home team in the second period and despite an impressive team performance they were not able to recover the deficit. Titans top scorers: Luca Virag 26, Ella McCahill-Brown 12, Imogene Williams 10. The Northamptonshire Under-11 County team travelled to Leicester to compete against two Leicestershire teams, one from Nottinghamshire and one from Derbyshire in the East Midlands Mini-Basketball Tournament. Head coach for the team was NEBC Titans Under-14 coach, Mike Round, who had prepared a team of boys following a series of selection and training sessions. Three boys from Titans were selected team alongside boys from a number of local clubs. Ethan Round, Ewan Nelson and Kai Clement all made positive contributions as the team progressed through the tournament, displaying some impressive skills and teamwork. Northamptonshire eventually won all four of their matches on the day and were duly crowned East Midlands Mini-Basketball Champions. Titans were able to include 18 boys spread across three teams in the U13 Central Venue League at Northampton School for Boys. 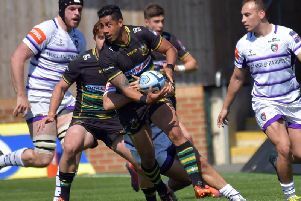 All three teams performed extremely well and the only loss one of the Titans’ teams suffered was when they played one of the sides made up by their club-mates. Kettering Phoenix’s men’s team claimed an 86-74 win at Groby in their most recent outing in Division One of the Leicestershire & Rutland League. Miguel Espada (18) and Eduards Helisek (16) led the scoring. It has been a tougher time for their second team, the Suns, as they suffered three defeats in a row in Division Three with their latest setback being a narrow 42-41 loss at Rawlins B, in which Andile Chiwuta (12) and John Clarke (10) scored well. Phoenix enjoyed a 41-35 success over Moat Flames in the Women’s Central Venue League with Esme Kinghorn (14) and Diana Parv (10) leading the way. Under-15 results: Kettering Phoenix A 7 Northants Thunder 11, Kettering Phoenix A 36 Northampton Condas 5, Kettering Phoenix A 13 Northants Thunder 17, Kettering Phoenix A 35 Northampton Condas 14, Kettering Phoenix B 4 NEBC Titans 12, Kettering Phoenix B 18 Northampton Condas B 10, Kettering Phoenix B 12 NEBC Titans 16, Kettering Phoenix B 15 Northampton Condas B 14. 34, Kettering Phoenix B 14 Duston Hawks 6, Kettering Phoenix B 21 Kettering Phoenix A 8.